At a time when big-city restaurants are going granular—curating an intensely focused clutch of items from individual cities or regions—Perlick has opted to go in the opposite direction and pitch a voluminously large tent. In terms of scope and inspiration, his menu has as much geographic diversity as a coffee-table atlas. Scallops saltimbocca. Maine lobster rolls. Sashimi-grade ahi tuna. Duck confit. Low Country shrimp and grits. Perlick’s aim is to import as many different cuisines, ingredients, and flavors from around the globe and present them in fun and whimsical ways to the community he’s called home for almost seven years. It’s no coincidence, therefore, that Perlick has papered over the walls of his spiffy dining room—which glows with tiered chandeliers and warm woods—with a stunning selection of maps. Maps of Illinois. Maps of Italy. Maps of Spain. Some are blown up big as wallpaper. Others are set into frames. Surrounding each are giant black-and-white images of people in various states of play—whether it’s a group of women leaping in the surf or a group of construction workers enjoying a meal on steel girders atop an unfinished Waldorf-Astoria Hotel in the 1930s. The underlying message? High brow. Low brow. Somewhere in between. It doesn’t matter. Perlick is going to give you what you like to eat. But in typical Midwestern fashion, he’s not taking things too seriously. It’s whimsy meets sophistication, an ideal milieu for holiday parties or family get-togethers. Take the house’s tõgarashi-dusted crab fried rice topped with a fried egg and moisturized by two uniquely different sauces: an acidic yuzu ponzu and a chili aioli. The textures are as sublime as a farmhouse breakfast. Crisp rice. Runny eggs. Creamy aioli. 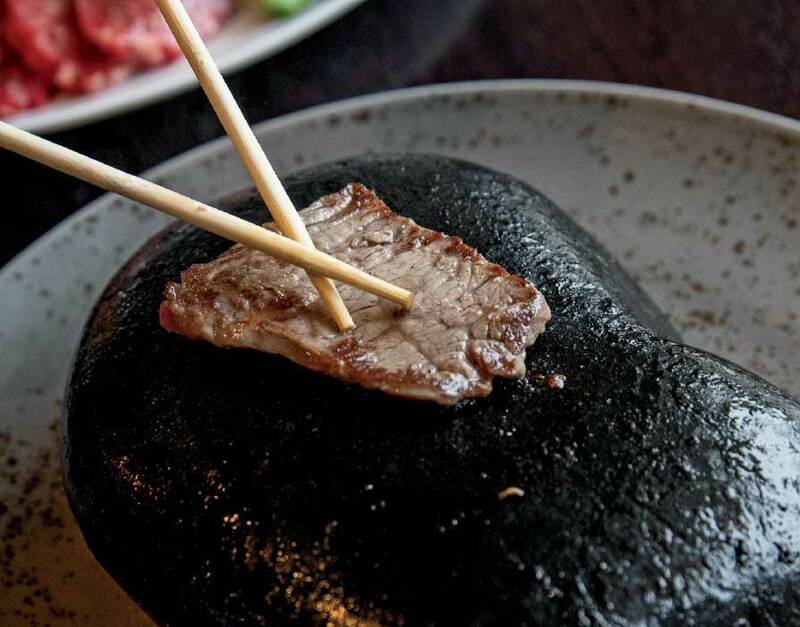 Brothy ponzu. But the flavors are lights-out: an Asian crab boil doused with fine and funky jolts of acidity, citrus, and smoky spices. There may not be a better, more playful take on fried rice in town. If anything, Perlick has a soft spot for big bold flavors spiked with undertones of sweetness. His incredibly rich bone marrow starter not only comes smothered with a thick layer of bacon-onion jam, it’s snowed under with an avalanche of capers and cheese. Think foie gras topped with a thick berry gastrique in a more spreadable form. Sometimes the intent seems not only to surprise the taste buds but shock the retinas. His aptly named “wild, super shrimp cocktail” looks, from afar, like a giant lobster has been flung over a martini glass. In fact, it’s a giant shrimp pulled from the waters near Nigeria, served with a smart Marie Rose cocktail sauce. 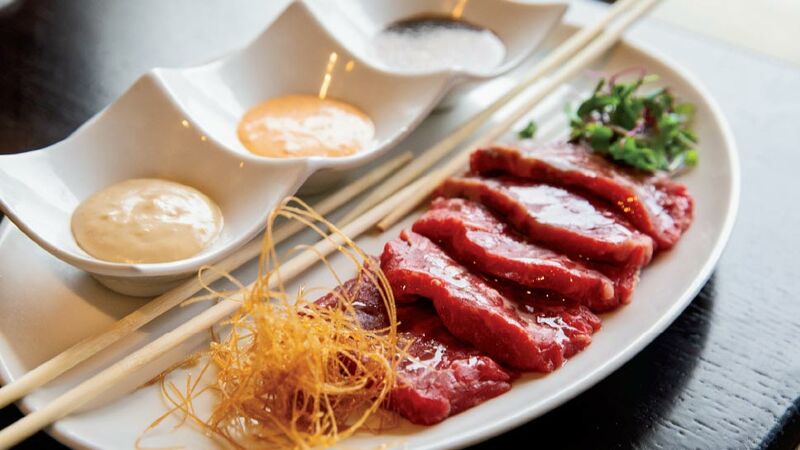 The only thing that draws more attention may be the hot rock steak app, which allows diners to sear thin slices of New York steak on a 500-degree black rock and then dip them in a trio of sauces. You can thank Perlick’s travels, including his time at Montarro Grille in Algonquin, for this diversity. He obviously made an impression, pulling some of his staff over to Region with him, which equates to friendly servers well schooled in the preparations behind every dish. You’ll need their advice when picking your entrée. Order the miso-glazed cod, which offers more fried rice as well as an ultra-tender bass topped with a crunchy layer of noodles and a side of fresh asparagus. 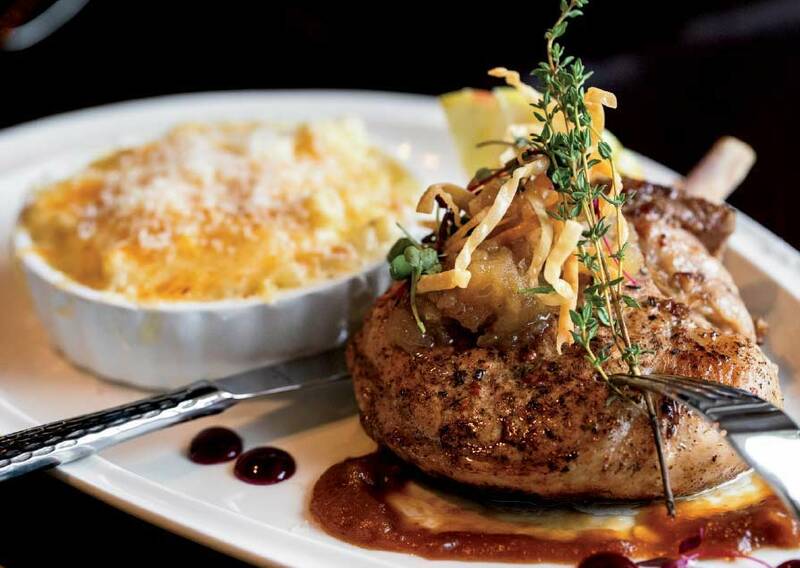 If you’re leaning toward proteins, try the stellar Cheshire pork chop, a breed of pork sourced from the Carolinas that offers the ideal fat-to-meat ratio for the grill. After being brined in a clove and all-spice solution, the chops are glazed in a bourbon-mustard sauce and topped with a warm apple confit and crunchy onion strings. It’s pure Autumn—all warm spices and juicy pork goodness—that’s accompanied by another staple: a mild Wisconsin white cheddar mac and cheese. 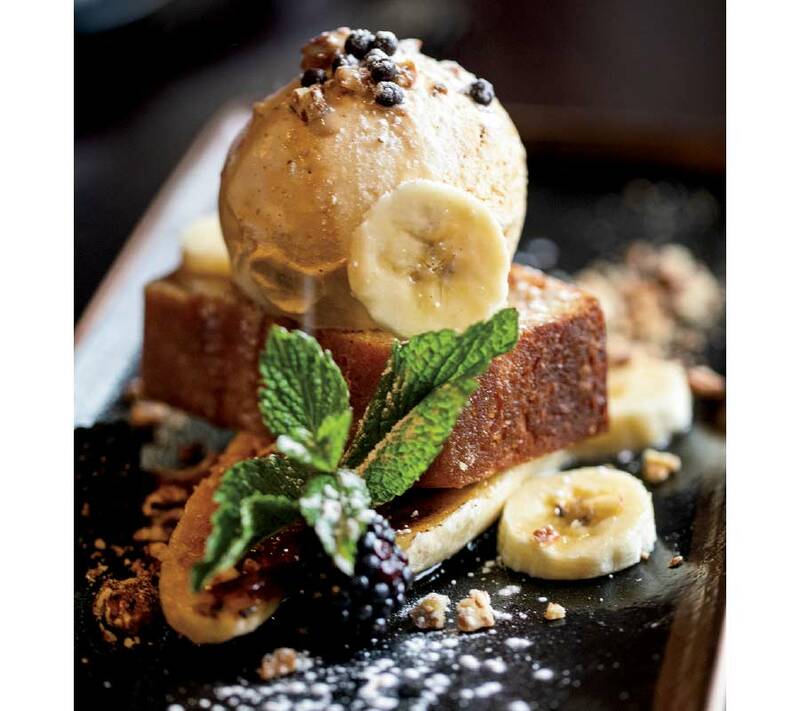 About the only thing that’s more Barrington may be the house’s dynamite bread pudding topped with a real treat: a smoked maple ice cream that melts into a smooth liquid that tastes like creamed syrup. It’s breakfast by way of dessert. It’s a fitting end. By this time, you’ve likely traveled around the world via Region’s unique offerings, only to find yourself back home in Barrington, where Perlick has found the perfect place to set down roots for what is one of the most well-traveled menus around. Region Kitchen + Bar is located at 718 W. Northwest Highway in Barrington, 224-848-4005, regionrestaurant.com.